Some of the best dialog ever written. Casablanca. Photo courtesy: Warner Bros.
It’s easy to recognize good dialogue when you hear it. But writing it is a bit more difficult. In films, you only have time for “just the headlines” as my former UCLA professor Richard Walter always says, so you have to keep dialogue to a bare minimum. Powerful dialogue is distinct for each character, meaning each character has their own vocabulary and rhythm. Powerful dialogue is slightly stylized without being affected, meaning it may incorporate rhyme, repetition or pacing. Check out ScreenwritingU’s Advanced Dialog Class – Starting April 22! Let’s take a look at a scene from Sorkin’s The Social Network (2010). There is a clear shift of power in this scene. Mark (Jesse Eisenberg), is in control at the top of the scene, but his lack of empathy, combined with his obsession for Final Clubs, make him unable to recognize how insulting he’s being to Erica (Rooney Mara). His offer to take her to exclusive events is a slap in the face and she breaks up with him. When Mark repeats that she doesn’t need to study, Erica demands to know what he means. His answer, “Because you go to BU,” shows he believes he’s superior to her intellectually. While this may be true, he doesn’t understand why you can’t say things like that to your girlfriend. She exits. Have the power shift clearly from one character to the other by the end of the scene. Repetition can increase conflict and help the characters build to an emotional revelation. Mark’s need to control Erica and talk circles around her reveals his character: he’s an egotistical jerk. Erica breaking up with him for being an “a-hole” reveals hers. This is how you use dialogue to show that two people are really in love. Butch (Bruce Willis) has been through quite the ordeal, having been kidnapped and beat up. He barely makes it out alive. When he comes to get Fabienne (Maria de Medeiros) so they can split town (his super objective), she is in her typical self-absorbed state. Concerned for both their safety at time ticks away, he gets verbally forceful with her, raising his voice, “Honey, we’ve gotta hit the f-ing road, come on!” What does she do? She starts crying. He loves her dearly, and he knows he has to switch tactics to get her to comply with his super objective. So he asks her about the pancakes. This soothes her (secondary objective) and she finally hops on the chopper. The last line in the scene, “Zed’s dead, baby. Zed’s dead” is super memorable. People in love know how to push each other’s buttons, but also how to sooth each other. They often do both in a scene. The dialogue in this scene reveals character: Butch loves Fabienne enormously while Fabienne is self-absorbed and childish. Rhyme can make for a great button to a scene. “We’ll always have Paris” and “Here’s looking at you, kid” are such memorable lines! But why? Part of it is Humphrey Bogart’s performance and the way he restrains emotion, holding in the pain of losing Ilsa (Ingrid Bergman) for a second time. 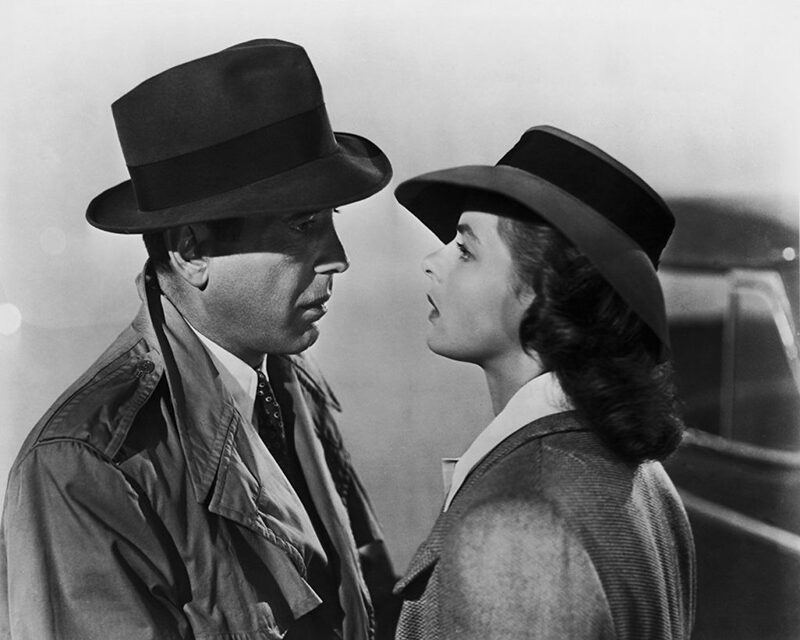 The other part is that “We’ll always have Paris” is a redemption for Rick (Bogart), the subtext being, “Ilsa, I loved you before in a selfish way, I wanted you all for myself. Now I understand that I love you enough to let you go.” This line firmly solidifies his arc. He went from broken and bitter to a grown man who, in the face of war, has put away childish things like romantic love. “Here’s looking at you, kid,” is said first in Paris, when they were “kids” – young and carefree. It is repeated here as an acknowledgment of the specialness of that time in their youth and a reinforcement that their love will live on. Subtext can give even the simplest lines deep meaning. A line may change meaning when it is repeated after an emotional turning point. Ilsa’s strong emotional reaction to both lines helps make them memorable. This entire scene is a verbal game of chess. They are each testing each other’s skill level, carefully watching how each responds to a pawn, a rook, a knight. There’s a turning point in the scene when they are talking about why the killer Buffalo Bill removes the victims’ skin. Clarice (Jody Foster) says for a trophy, Lecter (Anthony Hopkins) says he personally never kept trophies of his victims. She replies, “No, you ate yours.” In that moment, he realizes she has the intellectual stamina (and the guts) to keep up with Hannible the Cannibal – something very few people can do. He rewards her by taking a look at the questionnaire she’s brought. But the reward doesn’t last long. The rest of the scene involves more tests and just when you think she’s failed, the power shifts. Enduring the bodily fluid from Miggs proves her mettle, for which Lecter gives her another reward – the name of a lead in her investigation. Sometimes dialogue is a game. Games are more interesting when opponents are both equally strong because you don’t know who’s going to win. Decide which strategy each character is using and when/why that strategy changes. Are they stalking each other like a lion? Or are they battling like soliders? Lecter’s dialogue is a mix of charm, insults and the truth, keeping the other character on her toes because she doesn’t know which is coming next. What scenes do you think have the best dialogue. Let us know! 5 Replies to "Tips for Writing Powerful, Memorable Dialogue (with examples!)" Great dialogue references thank you. Delivery just as important. Every Woody Allen movie borrows heavily from a previous work. As for example ‘Play It Again Sam’, deeply reminiscent of ‘Casablanca’. How did Woody Allen do it? How did he model his films on books and movies from the past and never get sued or even accused of plagiarism? Hello I really think that The “Pulp Fiction” part is part of a vast collection of writings missing from Cleveland since 1978. I have been thoroughly writing drafts for screenplays. For movies & plays. Now I am sure after “The Lovely Bones” show up. A manuscript, script, journal & notes after a woman made an anonymous phone call to our home around 1973 to talk over my work. Afterwards, ended up missing. 2007 On The Today Show some people have been on to talk about this work. I’ve been counting around 128 drafts & seven manuscript ideas since 2003. One thing I believe I’ve been doing in 1973 is what screenwriters do to start & complete a screenplays. Lay off the crack when making a comment. Miguel for starters – Learn to be less cryptic. I simply have know idea what you are talking about. Shanee – I always love your tips for writers. Thanks.